Guardate questo interessante articolo sull’uso dell’iPad come display domestico per comandare la casa e quindi tutto l’impianto di domotica. The iPad is definitely making an impact on people’s lives and as a result there are numerous examples of the device being used in new and innovative ways every day. iPads are cropping up everywhere —inside of old Macs, inside of cars and just about everywhere in this unique video about iPads and velcro. Now iPads are making inroads into the walls of our homes. 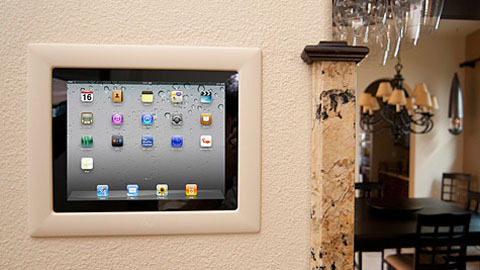 iPort has released a new product called the CM-IW2000 in-wall Control Mount for the iPad. The CM-IW2000 easily and with great flair mounts an iPad in the wall of your home in either a portrait or landscape orientation. The mount provides access to the home button and screen along with constant power to the iPad. The power button for the iPad has been extended to make it accessible on the CM-IW2000′s frame. 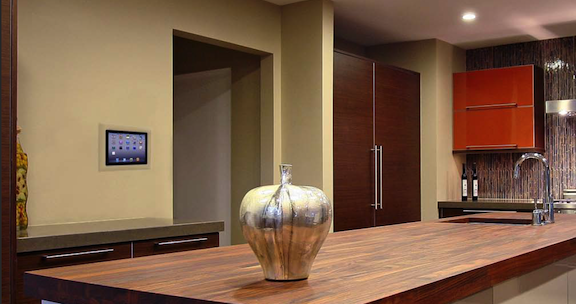 An iPad mounted in the CM-IW2000 can use a third-party supplied native iOS app to allow you to control audio, video, and lighting devices as well as the climate in your home while connected to a Wi-Fi compatible control system. The iPort CM-IW2000 in-wall Control Mount for the iPad is available now at a list price of $499. Bell’articolo, ma solo per chi conosce l’inglese, ti consiglio di fare articoli riassunti ma facili da capire, in italiano per chi non conosce lingue straniere. Ciao a te e grazie che popoli il mio scarno (spero per poco) blog. Se vuoi aiutare negli articoli del mio blog sei assolutamente il benvenuto. Una riflessione che stavo facendo con un collega che mi ha commentato: “caspita costa 499$”. Consideriamo che l’ipad minimale costa 499€. È chiaro che ci sono anche altre alternative ma il punto di forza dell’iPad è l’eco-sistema che Apple ha creato (sviluppatori, utenti, appstore) che non ha eguali in termini di numeri con altri sistemi. L’unico che puó scardinare questa supremazia è Google con Android. Oltre a questo è innegabile che il display è bellissimo come anche il multitouch e il tutto semplicemente FUNZIONA!